Kheiri, H., Mojaver, A., Shahi, S. (2015). Analytical solutions for the fractional Fisher's equation. Sahand Communications in Mathematical Analysis, 02(1), 27-49. H. Kheiri; A. Mojaver; S. Shahi. "Analytical solutions for the fractional Fisher's equation". Sahand Communications in Mathematical Analysis, 02, 1, 2015, 27-49. Kheiri, H., Mojaver, A., Shahi, S. (2015). 'Analytical solutions for the fractional Fisher's equation', Sahand Communications in Mathematical Analysis, 02(1), pp. 27-49. Kheiri, H., Mojaver, A., Shahi, S. Analytical solutions for the fractional Fisher's equation. 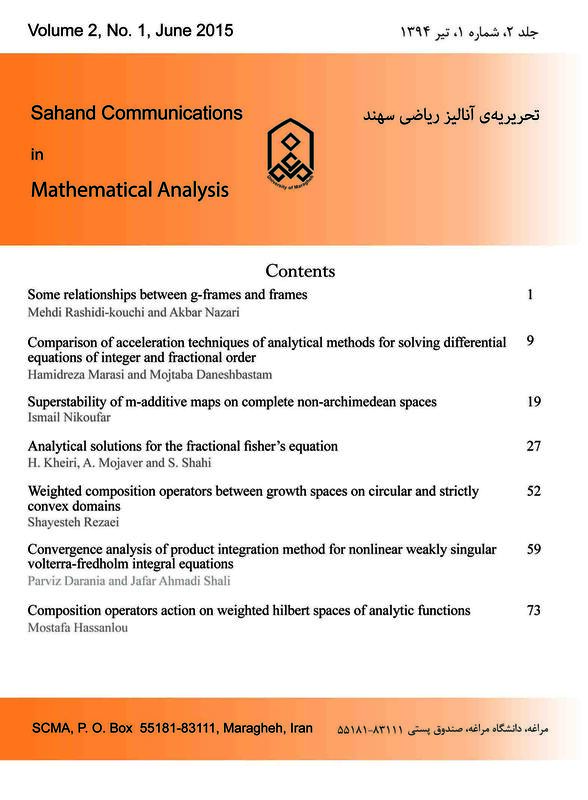 Sahand Communications in Mathematical Analysis, 2015; 02(1): 27-49. In this paper, we consider the inhomogeneous time-fractional nonlinear Fisher equation with three known boundary conditions. We first apply a modified Homotopy perturbation method for translating the proposed problem to a set of linear problems. Then we use the separation variables method to solve obtained problems. In examples, we illustrate that by right choice of source term in the modified Homotopy perturbation method, it is possible to get an exact solution. Adomian, G., Stochastic SystemsAcademic Press, New York, 1983. Adomian, G., A review of the decomposition method and some recent results for nonlinear equation, Math. Comput. Model., 13 (7) (1992) 17. Dimovski, I., Convolutional calculus, Publishing House of the Bulgarian Academy of Sciences, 1982.
problems for higher order nonlinear differential equations, Appl. Math. Comput., 218 (2011) 4090-4118. He, J. H., homotipy perturbation technique, Comput. Methods Appl. Mech. Engrg., 178 (1999) 257-262. He, J. H., A coupling method of homotopy tecknique and perturbation tecknique for nonlinear problems, Int. J.
Nonlinear Mech., 35 (2000) 37-43. Hilfer, R., Applications of Fractional Calculus in PhysicsWorld Scientific, Singapore, 2000. S. Irandoust-Pakchin, H. Kheiri, S. Abdi-Mazraeh, Efficient computational algorithms for solving one class of fractional boundary value problems, Comp. Math. Math Phys., 53 (7) (2013) 920-932.
boundary value problems arising in various physical problems, Comput. and Chem. Eng., 34 (2010) 1750-1760. Liao, S. J., on the proposed homotopy analysis technique for nonlinear problems and its applications, Ph.D. Dissertation. Shanghai Jiao Tong University, Shanghai, 1992. Liao, S. J., On the homotopy analysis method for nonlinear problems, Appl. Math. Comput., 147 (2004) 499-513. Luchko, Y. and Gorenflo, R., An operational method for solving fractional differential equations with the caputo derivatives, Acta Math. Vietnam, 24(2) (1999) 207-233. Odibat, Z. and Momani, S., Modified homotopy perturbation method: application to quadratic Riccati differential equation of fractional order, Chaos Soliton Frac., 36 (2008) 167-74. Odibat, Z. and Momani, S., Application of variational iteration method to nonlinear differential equation of fractional order, Int. J. Nonlinear Sci. Numer. Simul., 1(7) (2006) 271-9. Odibat, Z. and Momani, S., Numerical comparison of methods for solving linear differential equations of fractional order, Chaos Soliton Frac., 31 (2007) 1248-55. Podlubny, I., Fractional Differential Equations, Academic Press, New York, NY, USA, 1999. Reich, S., Constructive techniques for accretive and monotone operators in Applied Nonlinear Analysis, Academic Press, New York, 1979, 335-345. Book of Science, Cluj-Napoca, 2002. Sabatier, J., Agrawal, O. P. and Machado, J. A. T., Advances in Fractional Calculus: Theoretical Developments and Applications in Physics and Engineering, Springer, Dordrecht, The Netherlands, 2007. Samko, S., Kilbas, A., and Marichev, O., Fractional integrals and derivatives: theory and applications, USA: Gordon and breach science publishers, 1993. Yepez-Martinez, H., Reyes, J. M. and Sosa, I. O., Analytical solutions to the fractional Fisher equation by applying the fractional Sub-equation method, British Journal of Mathematics & Computer Science, 4 (11) (2014). Zhang, X. and Liu, J., An analytic study on time-fractional Fisher's equation by using HPM, Walailak Journal of Science and Technology (WJST), 11 (12) (2014).